Her art is meant to impact, often emerging from controversial ideas and from true concepts that cannot always be put in words. Born in Sao Paulo, Suzana de Paola has lived in Brazil, Europe and the United States. At 8, she was already aware of her artistic penchant, winning an art competition at her school in Illinois. Encouraged by her parents, she went on a quest to discover her unique style, a goal she reached in 2000 after attending art classes in Italy. The artist describes her art education as more “street” than technical. Never having attended professional classes, she’s been the ultimate autodidact, learning by practice, analyzing the work of other artists, and watching small tutorials on TV or the Internet. Acrylic on Canvas is her main medium, although she has occasionally mixed in collages and done Batik pieces that create a totally unique effect of colors. She’s been very successful in exploring different mediums. 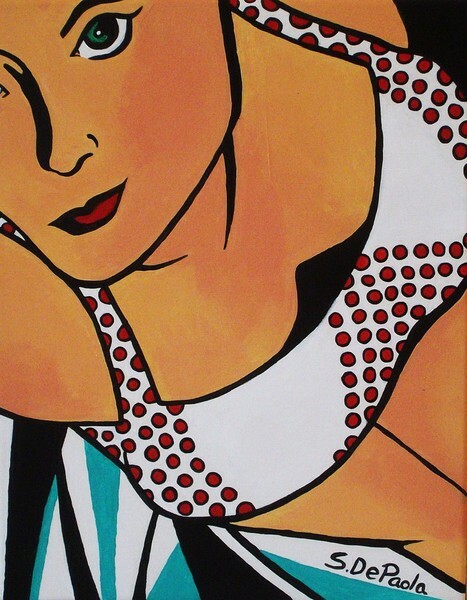 “Art is my therapy,” says de Paola, who’s been influenced by Tamara De Lempicka and the Pop Art movement. Salvador Dali and Edward Munch are also among the artists she studied, and their ideas stayed with her. The artist is currently working on an Modern Egyptian theme collection. She fell in love with the Hieroglyphic Alphabet, and uses it to create pieces that take the viewers into another reality. De Paola plans on creating series based on her travels while keeping her figurative style intact. She’s interested in networking in the Arts and broadening her skills. She’s joined the SFAA (South Florida Arts Association) and attends many Art festivals. Among the pieces of work she’s created, one of her favorites is the “Musician,” which illustrates the concept of a musician making “love to the microphone,” emphasizing the passion for music. “I believe that without music the world would be (even more) insane,” says de Paola. Her work can be seen on www.suzanadepaola.com.